Elizabeth Warren has come out of the presidential primary gate swinging with a proposal for a 2% wealth tax on assets over $50 million, rising to 3% on assets over $1 billion. Despite the freak-out by conservative pundits, I’d like, in this post, to put these numbers in perspective with a bit of basic math. This, in short, is not as radical a proposal as it is made out to be. 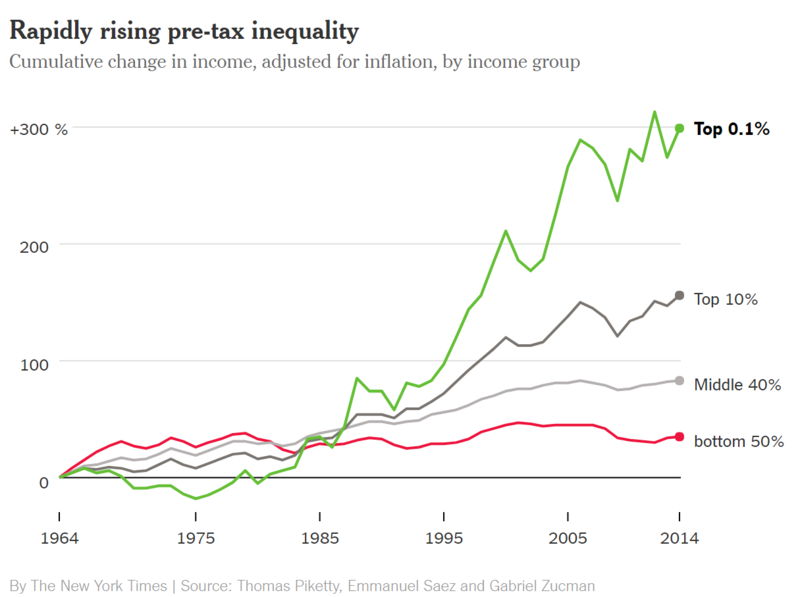 I think it is important first to see who this proposed tax applies to, which is the top 0.1% of U.S. taxpayers, whose rise in wealth has generated an unprecedented gap over the last 30 years between their wealth and the remaining 99.9% of taxpayers, a trend I documented in a post from last year. There are clear reasons why this spread has been exacerbated in the last 30 years. First, the decline of effective tax rates on high-income taxpayers, second, the taming of inflation, and third, overall economic growth favoring the top tier incomes over the middle class, all contributed to the growth rate differential. How big is the “hit” to the top 0.1%? In other words, that $50 million in wealth is likely generating, without touching it, between $3.5 and $5 million per year, again much of it untaxed capital gains. The Warren proposal would take away only $1 million of that otherwise-untaxed gain, a “marginal tax rate” of between 20 and 28%, which is lower than the marginal tax rate on regular income at that level. And by the way, if you are getting taxed at the maximum tax rate already on that $5 million, then you likely have a bad accountant, or are extracting too damn much in spendable/taxable cash. In short, I shed no tears for that level of marginal taxation. Where does the capital sit? A major criticism of the Warren proposal is that a lot of this wealth is invested in hard-to-value non-liquid assets, such as real estate or small-company ownership. However, the odds are that other financial documents related to that wealth at that level are tied to impartial appraisals of value. Other segments of the financial markets rely on these appraisals for major related financial transactions, so this is not an insurmountable challenge. A second criticism is whether this would encourage increased off-shoring of financial assets. This is already a problem for taxing authorities, but it must also be recognized that off-shoring of assets adds a significant level of riskiness to the investment, especially if the assets are not denominated in U.S. dollars. In the end, as I have written in an earlier post, money is simply a trusted and stable “denominated choice.” The reason people around the world prefer these “choices” to be denominated in U.S. dollars is precisely the reason why the rich need to pay a significant share of U.S. tax revenues. The denomination in dollars works only as long as the United States maintains a healthy and secure state. And that security costs money. Mark for sunset all deductions, credits and special rules used to reduce taxes by fewer than one in 1000 taxpayers (or perhaps even one in 100). These are truly “special interests,” and this gets rid of many thousands of pages of messy, complicated tax code. Treat all forms of income equally (“income is income”). No more preferences for “rich people’s income” like capital gains and carried interest. This gets rid of more thousands of pages of tax code. Restore a strong progressive tax rate curve with a much higher top rate (but not necessarily the feared 70%). Add more brackets or make it an exponential curve to get rid of bracket edge problems. 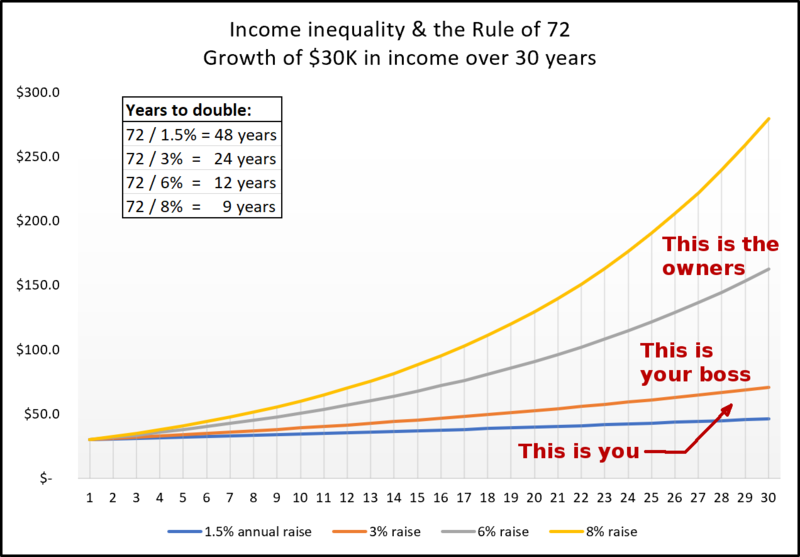 The Rule of 72 is a quick way to calculate the doubling of a growing sum of money. Just divide the growth rate into 72 to see ho many years it takes the sum to double at that growth rate. See this post for more on this math. I think I like your alternatives better. I’m not sure I buy the idea that impartial appraisals are always available (or even that impartial). For example, how much is Donald Trump’s “brand” worth? (Is it “wealth” in the same sense that real estate is?) What about wildly fluctuating prices on assets that have no independently verifiable value? (I’m looking at you, bitcoin.) While wealth is real, it can be problematical to value differing kinds of wealth in consistent ways across a wide variety of asset types. You could tax Trump’s brand based on what he publicly claimed it is worth. Measuring income versus expenses for businesses is also fraught with estimates and complexities, but CPA firms have long been in the business of tagging a defensible valuation on these transactions. They are also in the “wealth valuation” business. I suspect it would rare to find a closely-held business that has not had a rigorous valuation study conducted on their behalf.